Scene: Mr. Smith (S) comes to front desk of the hotel and requesting for staying more but not willing to pay. 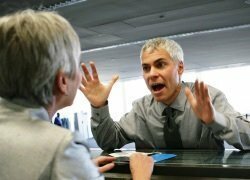 Try to understand approach of the Front Desk Agent (F) to handle an angry guest. F: Good Morning Sir. May I help you? S: Actually i just got the news that my flight will arrive at 4.30 pm but it supposed to come at 10.00 Am. I am 60 years old as you see, so it will be so difficult for me to wait in the airport for such a long time. I want to occupy your room till the afternoon. F: Sir, you are lucky as we don’t have any booking of that room till afternoon. But sir as you know, 12.00 Pm is our last check out time and if you like to stay more then you have to pay for that. S: What (With a loud voice). What the hell are you talking. Why i have to pay. F: Sir, it is the rule. Sir, you will be happy to hear that you will not have to pay full day room rent. If you stay till afternoon then you will be charged only 50% of the room rent. S: Hey man. Don’t you know i have settled my account already? S: What but? Listen…hey listen to me. I will not pay a single cent for 4 hours. Are you deaf. I will not pay anymore. Is it clear to you. F: Sir i really understand your problem. But i am afraid i have nothing to do. 12.00 pm is our last check out time and if you want to stay more you have to pay, that is the rule we have for all our guests. S: I have been staying in this hotel for 3 days. Your service is so poor. I will complaint against you. F: We are very sorry sir. OK… I can do one favor for you. F: Sir, after 12 you can leave your baggage to us and enjoy in our lobby. And you will not be charged anymore. S: damn it man! You people are mad. Listen to me clearly. I know how hard to earn money. I will not pay anymore for 3 to 4 hours. F: Sir you can really enjoy in our lobby for the rest of the time. S: No…never. I like to sleep in my room till 3 pm and i will never pay anymore. F: Then sir please be seated in our lobby please. I am calling our manager. He is the right person to solve your problem. Please be sited there. Our manager will come within 5 minutes. S: Ok i am waiting. Let him come and talk to me. F: Thank you sir for your patience ! Lesson you learn from the Dialogue: As we see here Mr. Smith (S) makes totally an illogical request. But look at the approach of the front desk agent (F). Mr. smith personally attack him several times but all the time he remain calm and cool and moreover being a true professional. As the situation was out of his control he refer the problem to proper authority and tries to make the guest calm. This is the proper way to handle an Angry Guest. For more Guest Handling Tips read this tutorial: Lean How to Handle Guest Complaint in hotel or restaurant. What should i do if i am a Manager, how should i handle these kind of guest..?? in this case i think if we have some single room empty or rest has to provide for that particular guest. How should I do then if I were a Manager? Well, I have to agree that the agent kept his cool…There is a new breed of traveler and it is the type that will raise their voice and complain as much as possible in order to get something for free. I am a General Manager for a large property and see it more and more. The industry is not like it used to be…sad.